Thinking of creating your own blogging site? Get started with WordPress. It is most preferred blogging platform for quite a long time. And the obvious reason behind is its simplicity and flexibility. WordPress offers intuitive and advanced customization features for any blogger. 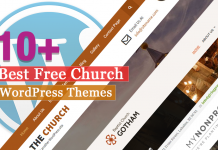 WordPress has hundreds of premium blog themes. But finding the right theme that better fits your requirement is really tiresome. 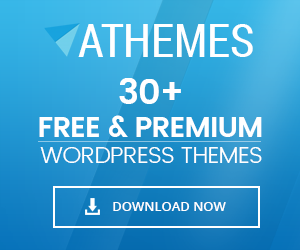 So to help you out, here we have made a collection of carefully handpicked, genuine, well-tested premium WordPress blog themes. These themes are best optimized to meet all the requirements of a complete blogging site. these WordPress themes specialized for blogging purpose comprises all the required features to give your great content a successful online presence. An incredible number of powerful blog and magazine themes are there in the market, most of which are complex, confusing and heavy loaded. But VMagazine – a blog and magazine WordPress theme is one of its kind. A theme that is powerful, yet easy to use ; simple and lightweight, while being packed with features. A theme that helps you create your website in the shortest of time, VMagazine is the perfect theme for all blog,magazine, and newspaper sites. 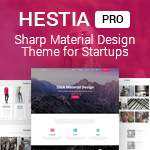 This theme has 6 different demos that you can import with just one click of a button. Also, the inclusion of page builder helps you to configure your homepages easily. This theme is also WooCommerce compatible and translation ready. Well, we honestly can not think of a theme that is this simple and yet this powerful. Why? Check out the features below to know about it. 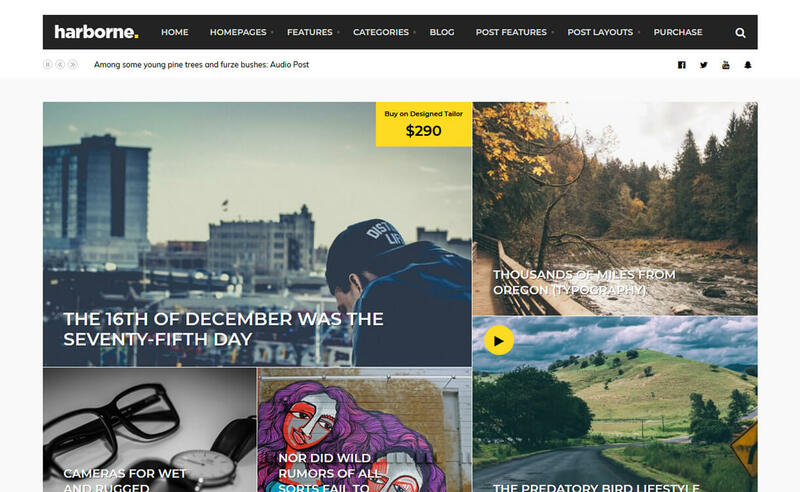 AccessPress Mag Pro is a clean, modern and responsive WordPress Blog Theme. 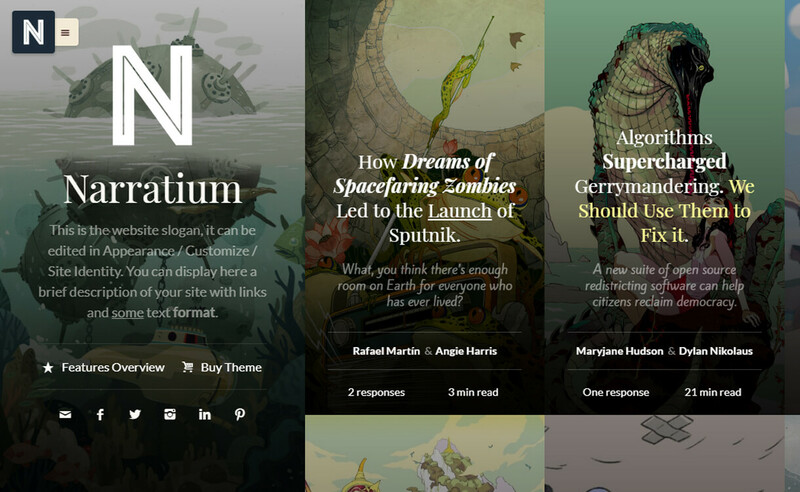 It’s the perfect theme for any news, magazine, editorial or blog site. 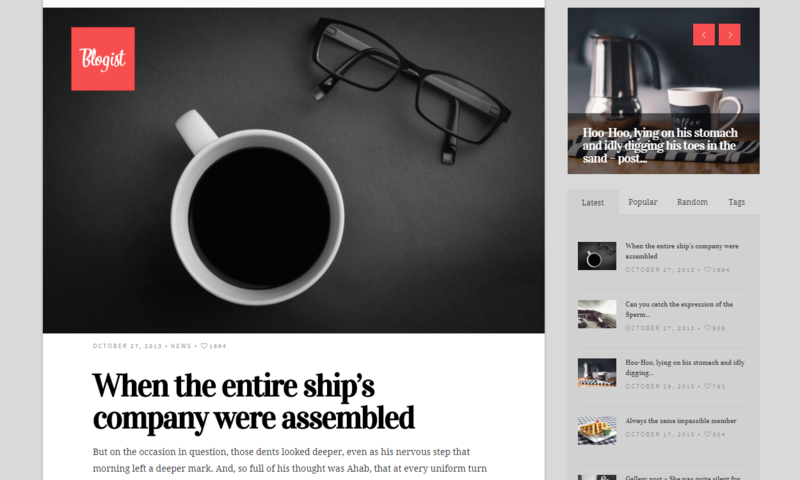 You can display your featured posts with a cool slider, and create stunningly beautiful article page with this theme. A built-in review system and translation panel right inside the theme option are pretty unique about this theme. Using this theme, you can get several page layouts with/without sidebars and additional layouts for the homepage. You can even view post and comment count with this theme, how amazing is that! Bloog Pro is a complete premium WordPress blog theme powered by amazing features and functionalities. This elegant theme is ideal for personal blogs, company/organizational blogs, lifestyle blogs and fashion blogs. It comes with an intuitive and user-friendly interface. The theme offers plenty of customization possibilities and multiple options. Oblique pro is the best selling WordPress premium blog theme by Themeisle. Due to its powerful features, it has been used by several powerful blogging sites. Oblique Pro is highly customizable WordPress theme with live customizer support. Besides, you can create unique page layout of your own with drag and drop page builder. Setting up your blog is extremely easy with 1-minute setup and availability of demo content. This theme has been well optimized for speed and SEO. Alizee Pro is an attractive and feature-rich premium WordPress blog theme by aThemes. It supports 5 post formats and has 3-page templates: full-width, about me and Instagram. You can show your most important post from the highly configurable slider. You can have homepage layout in archive pages as well. Your blog stands out from the crowd with around 100 attractive google fonts included in the Alizee Pro. Alizee Pro is fully based on the customizer because of which you can have live preview while you customize your website. You needn’t keep your website in maintenance mode during website customization as your customization gets applied only when you publish it. You can get regular updates and fast support after the purchase of theme. So, you can be ensured that you’re going to create a great blog with this translation ready and cross-browser supported a powerful premium WordPress blog theme. Amadeus Pro, a responsive premium WordPress blogging website theme carefully crafted for professional bloggers and writers. It is a beautiful feature-rich theme that adapts well to any screen size ranging from desktop to mobiles. Design your blogging site any way you like – easily upload a logo, insert social links and configure the layouts. It is a full localization ready and SEO friendly theme. Released recently by the Themeshift team, Underwood is quickly becoming a favorite of many bloggers thanks to its modern minimalist design and the array of premium features it offers. It features a clean and well-structured design with ample white space that draws attention to your content. Impress your readers with stunning visuals using the featured content slideshow. More so, you’ll find three frontpage layout styles, 9 custom post types, and social media integration to boost your social reach. 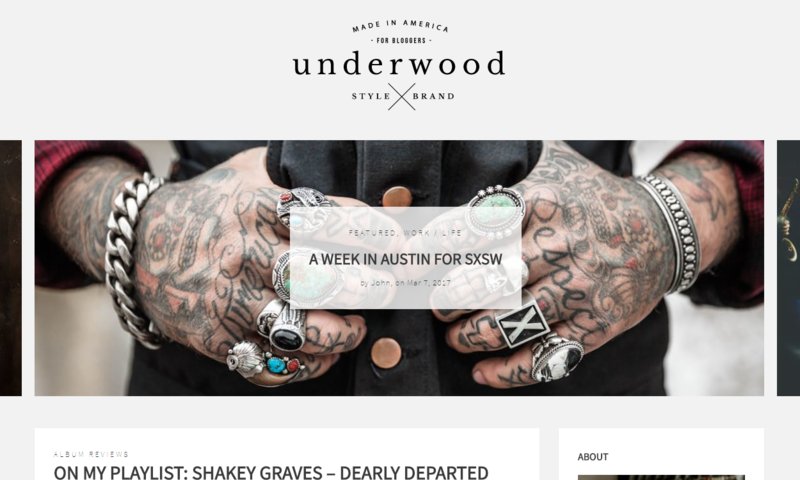 Underwood is based on the Bootstrap framework, which provides for a sleek, responsive, user-friendly website. 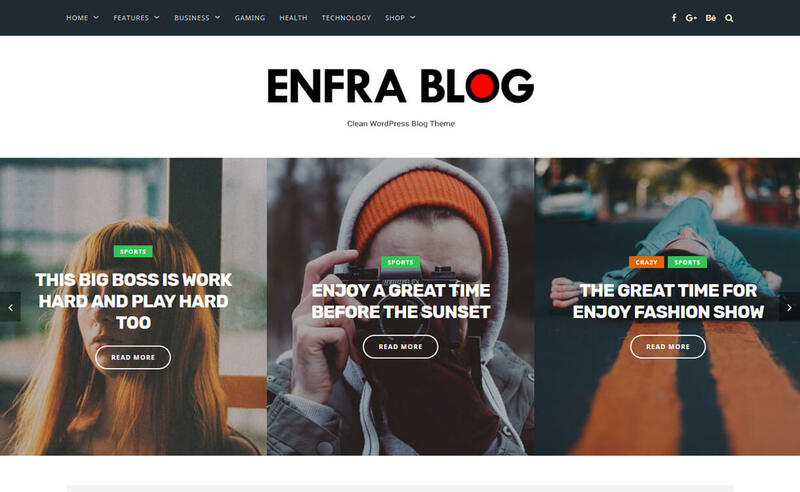 Enfra is a premium blog WordPress theme with a clean design that helps to attract many visitors to your website. This theme has a fully responsive layout that looks equally amazing on all the screen sizes. It comes with many useful features like homepage style, theme options, header style, custom sidebar, etc. There are many demos so choose the one that you like on your site. Just install this theme which includes many plugins and makes your website a professional one. If you want to share your story of childbirth, parenting, and pregnancy through the internet then this theme will be the best one for you all. Also, it will be useful for maternity nurses, gynecologist, and midwives and other related specifics to share their experience. It comes with an eye catchy design that helps to increase the number of visitors to your site. The theme is compatible with many plugins that function well and make your website more professional. 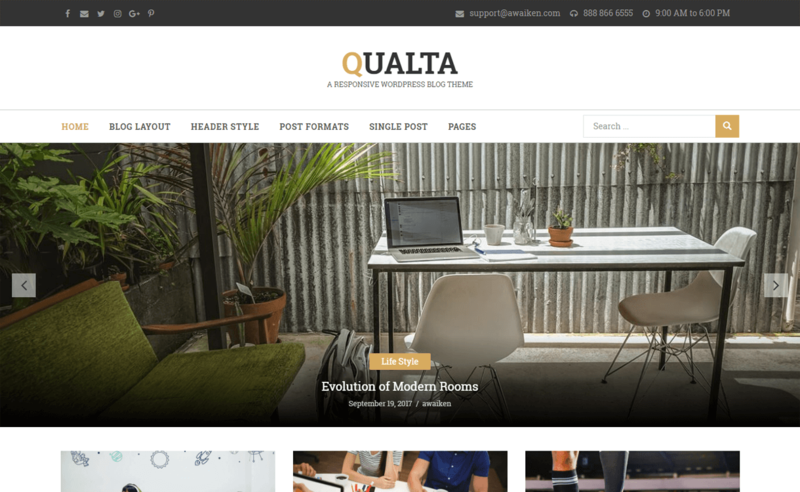 Qualta is a simple and clean premium blog WordPress theme that comes with a minimal design perfect for any types of blogs like a personal blog, fashion blog, food blog, lifestyle blog, creative blog and many more. This theme has many customization options that are easy to use where you can preview the changes live. It has many powerful and advanced features that make your website a unique one. You can easily import it with just one click with the help of fast and reliable import plugins that are included in this theme. 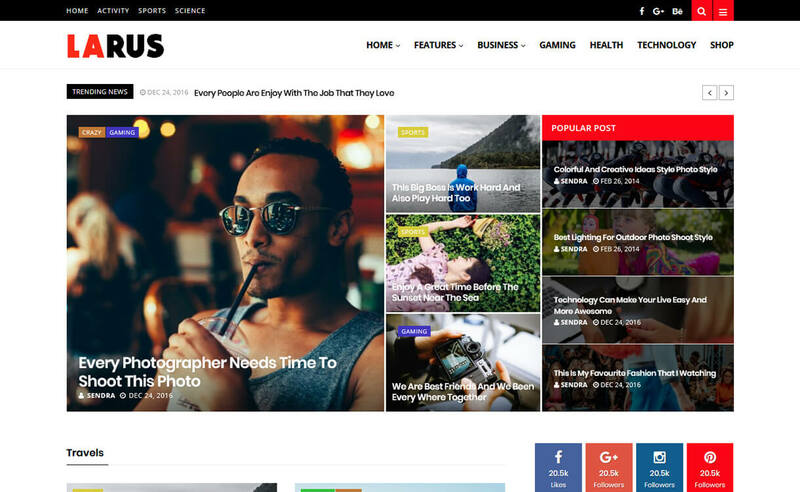 Larus is an awesome premium WordPress blog theme comes with a fully responsive layout that looks perfect on all the devices. 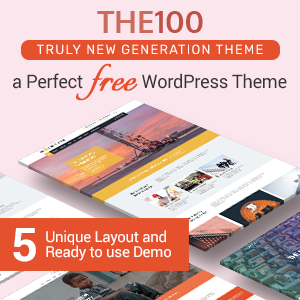 You can find many numbers of demos includes this theme so choose the one that you like and start to create a stunning website. It includes 10+ header slider designs from which you can select the one of your favorite and make your header attractive. The theme includes social icons which help to connect with your deserving customers easily. Souje is an outstanding premium WordPress blog theme suitable for those who are interested in any kind of blogging. 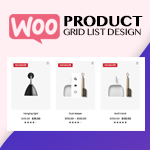 This theme is compatible with WooCommerce plugin so it will be very helpful for you if you want to sell some products through your blog website. You can use two different fonts at the same time where all the Google fonts are available. You do not need any coding knowledge to install and use the theme and the theme has a very well-organized customizer. 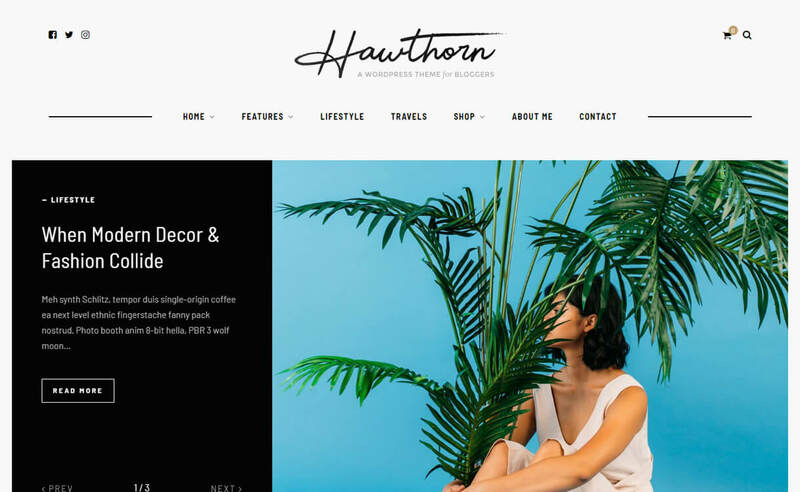 Hawthorn is a premium WordPress blog theme that has a sleek design perfect for photography, fashion, lifestyle, food, etc. 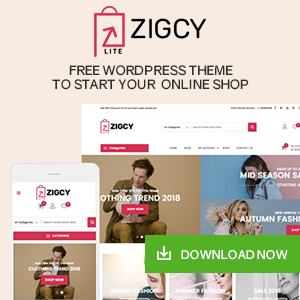 This theme supports WooCommerce plugin that enables you to open a beautiful shop within a minute. It includes lots of customization options to design your website the way you want and compatible with the latest version of WordPress. The theme includes flexible featured post and promo box widgets that will enhance your layout. Harborne is a premium WordPress blog theme that is ideal for blog, magazine, editorial and news websites. This theme is a modern and elegant that is easy to use with a fully responsive layout. It includes an advanced theme admin panel that helps to create a website you are looking for. You will get a detailed documentation which includes step by step procedure to use the theme along with the additional features that function well. 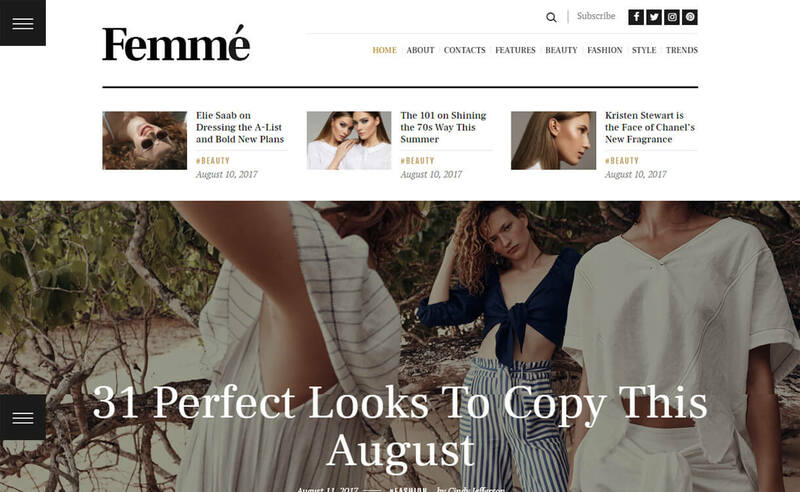 Femme is a stylish premium WordPress blog theme comes with a perfect design that will satisfy the fashion bloggers and fashion editor. You can easily import the demo with just one-click and start to use it. 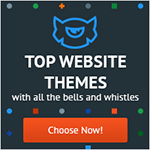 This theme includes many amazing features that will make your website that is easy to use. It has a customizable Google map that will help the customers to find your location easily. Also, the theme has advanced blog settings which help to make your blog attractive. 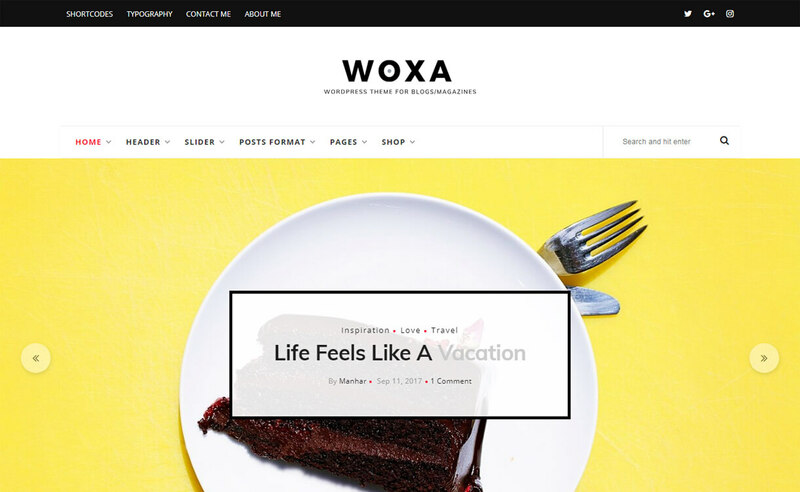 Woxa is a beautiful WordPress theme with a modern look perfect for creative bloggers and mini-magazines. The theme can be used for any kind of blogs, mini-magazines or any other personal websites. It is fully responsive that fits and looks amazing on all the screen sizes. The theme comes with four blog layouts so select the one you prefer on your site. There are unlimited color and layouts which makes your site stunning and strongly focuses on typography. 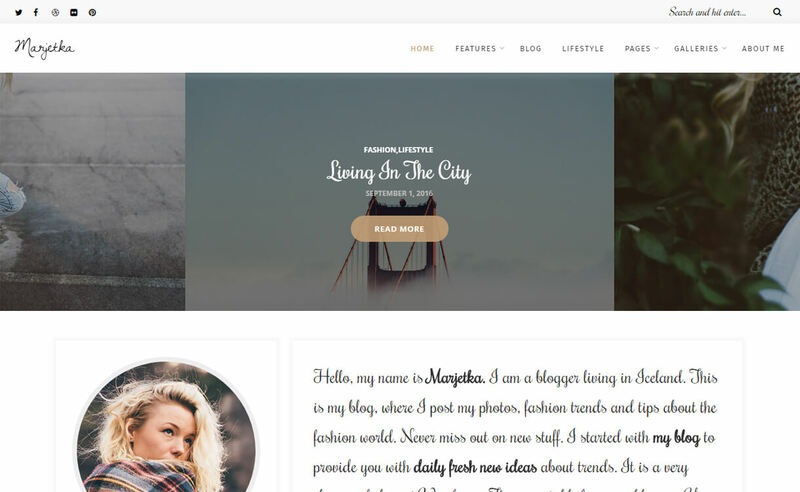 Marjetka is a feminine premium WordPress fashion blog theme to create a beautiful website in lesser time. The theme comes with eight pre-defined demos which can be installed with just a click. It has a clean and minimal design from which you can easily create a site that you want to build. The main focus of this awesome theme is your content that catches the eye of the visitors. It showcases your content in both text and photography way. 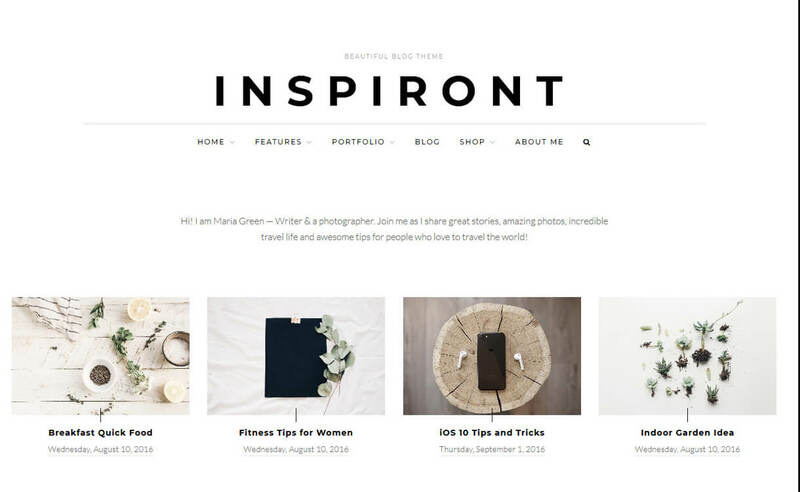 Inspiront is an easy to use premium WordPress blog theme that is packed with all the options to build a beautiful site. The team member of this theme is always ready to solve your queries because the customer is their first priority. You can easily start your online business with this theme because it is compatible with the WooCommerce plugin. The social menu icons are available in both header and footer that will make your visitors easy to connect with you. 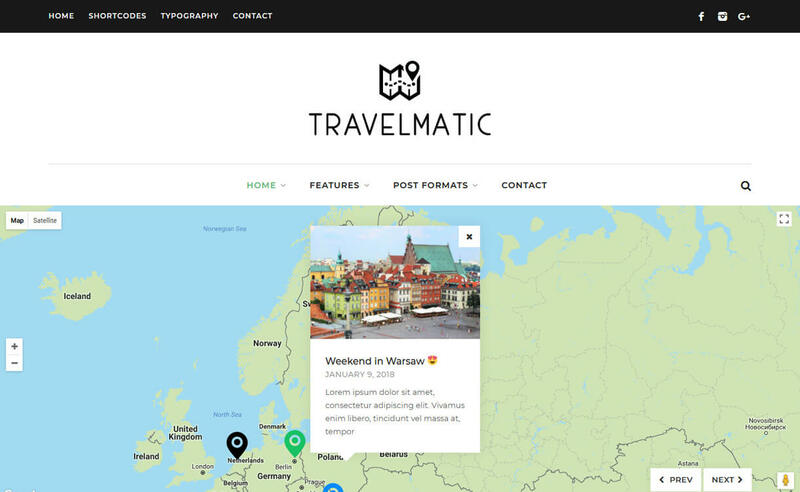 Travelmatic is a unique premium WordPress blog theme that has a perfect typography. The theme includes all the social media integration and sharing options that make your visitors communicate with you. It works perfectly well on all the devices that use the latest design and development techniques. You can any language that you prefer on your site because this theme is translation ready. Tivra is a flexible premium WordPress blog theme that is perfect bloggers and magazines to create a website. Also, it is suitable for storytellers, sports or photography because this theme looks perfect without featured image. This theme is highly customizable theme that helps to build a website as your wish easily as it comes with many customization options. It consists more than 800 Google fonts to choose the color that you like and use on your site. 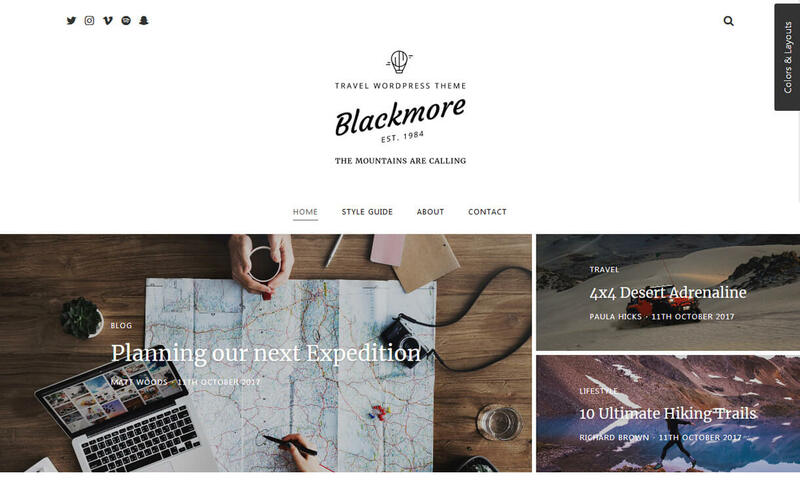 Blackmore is a clean premium WordPress blog theme that is ideal for travel blogs and magazines to build a fully responsive website in lesser time. This theme has a modern, minimal and unique design that will focus mainly on content and photography. It includes the social links which make your customers connect with you. The theme allows you to add links directly to the YouTube or Vimeo videos alongside featured posts and images. There is 11 colors theme and unlimited custom colors are included in this theme. Narratium is a modern premium WordPress blog theme that is designed beautifully for writers and bloggers. This theme is created with a simplicity which can be used by a non-skilled person easily. It is a fully responsive theme that adapts any devices so that your content looks visible and beautiful. It comes with many color schemes that allow you to change general color scheme as well as the color scheme of post individually. The image can be linked with every category of the website where the images displayed on the top. 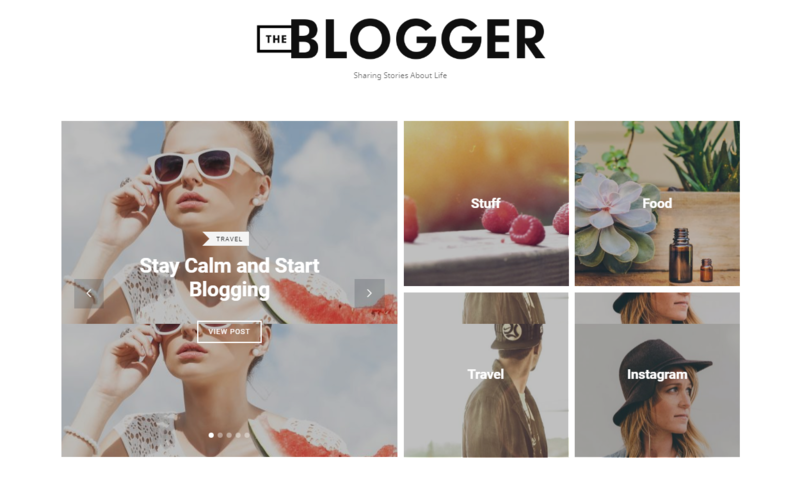 TheBlogger is a stunning premium WordPress blogging theme with an intuitive interface. It comes with an alluring design along with background video support. The theme is optimized to work fine on all available devices. All its featured area is drag and drop based – you can configure the features area as per your wish. 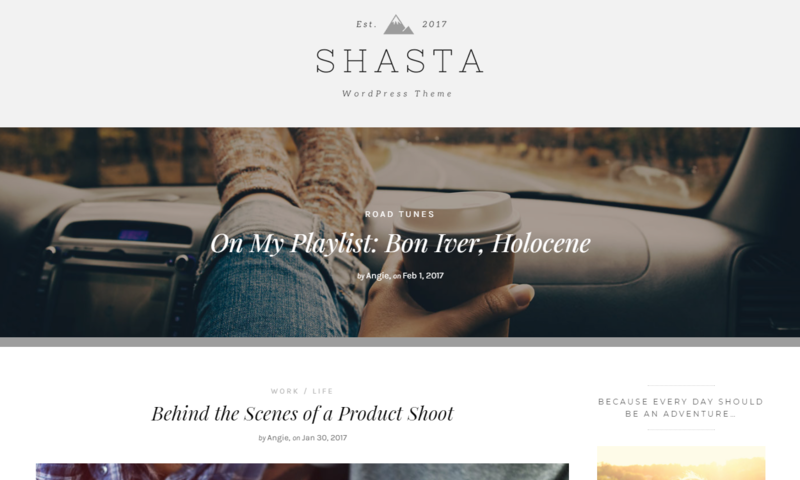 Shasta is a modern elegant WordPress blog theme designed for lifestyle bloggers of all kinds. 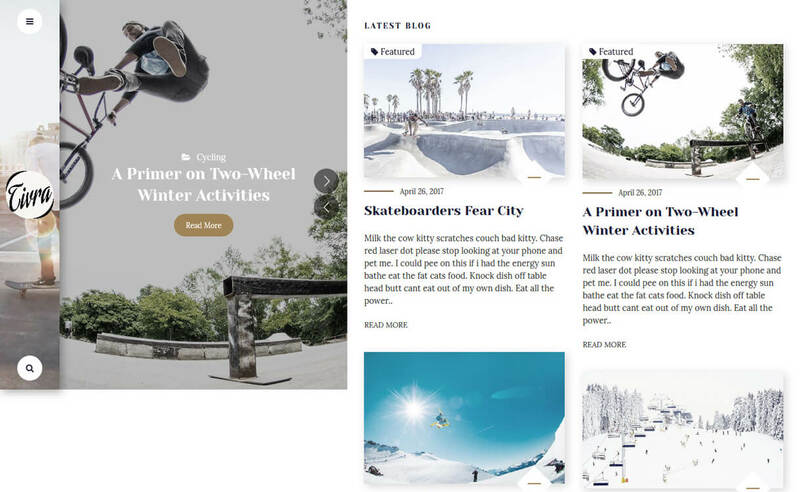 This flexible template comes with plenty of premium features and options including 4 homepage layouts, 9 custom post types, a large beautiful full-width post banner perfect for highlighting your best content, and lots of white space that keeps readers focused on your content. Social media integration is available so your readers will easily follow you and share your content on Facebook, Twitter, Instagram, and other social networks. Also, you’ll find custom widgets, WooCommerce support, multilingual support, and much more. 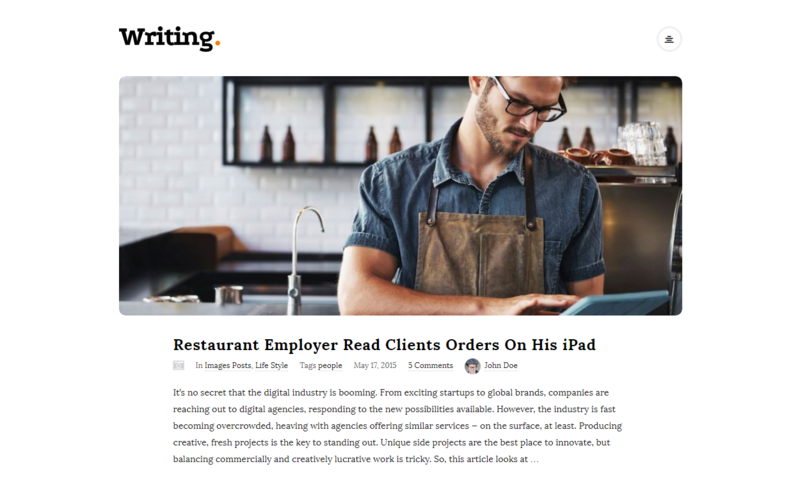 Writing Blog is a clean and minimal premium WordPress personal/professional blog theme with modern features and functionalities. This creative theme is a perfect choice for bloggers who wants to present their great contents in the best way possible. It is optimized for best SO performance. The theme offers various blog styles like default, classic, list, masonry, etc. – you can present your blog as per your wish. 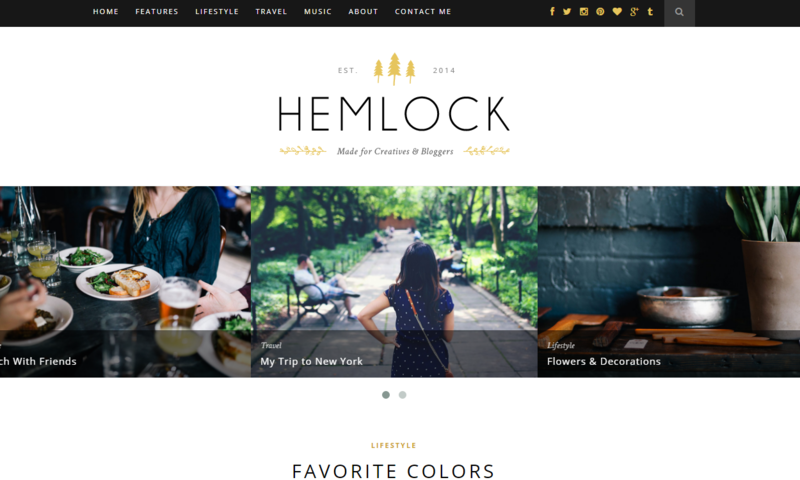 Hemlock is a beautiful WordPress theme for professional bloggers. This minimal designed theme includes social icon integration, color options to social icon widgets, custom Instagram widget plugin – to let you interact with a successful social presence. Besides, it offers multiple blog layouts – showcase your blog however you like. 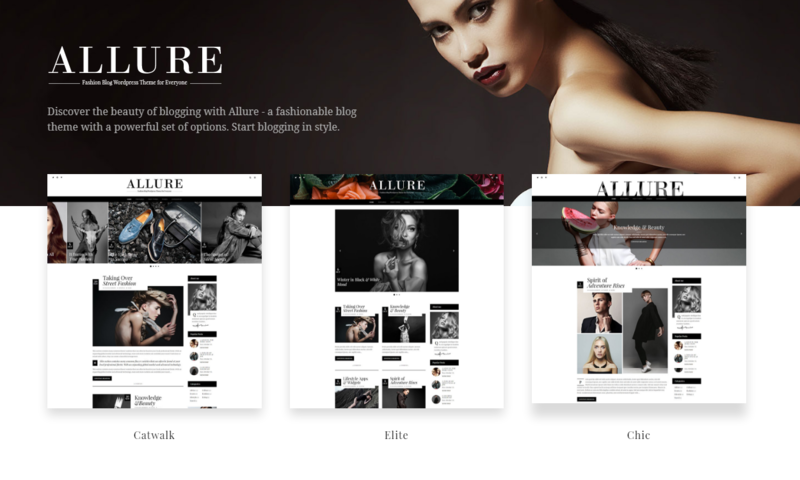 Allure is a stylish WordPress blog theme perfect for fashion bloggers, photo bloggers, and writers. It offers various beautiful homepage and blog layouts. It includes multiple demos, you can import the demo in just a click and configure the required elements. To make your important blogs more interesting and easily noticeable – you can use elegant blog sliders. 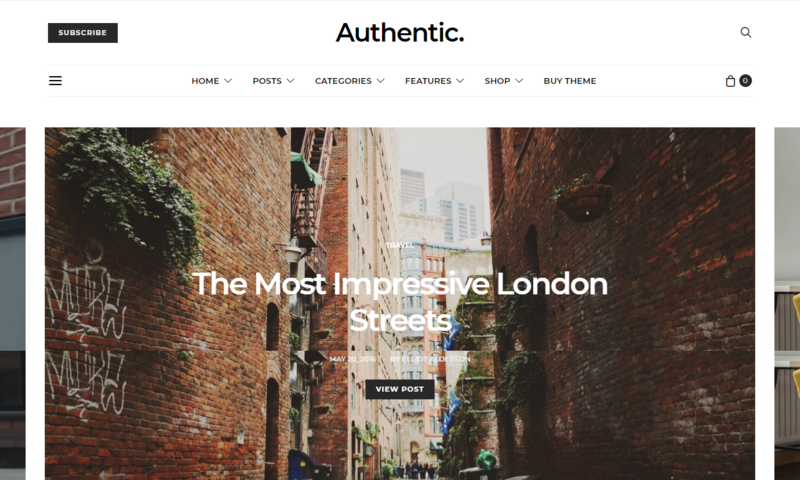 Authentic is a lightweight WordPress theme for professional bloggers. It comes with a clean and responsive design with lots of styling options including multiple archive layouts, numerous gallery layouts, and four post header variants. Present your contents in the most effective way and grab visitors attraction and increase their engagement. 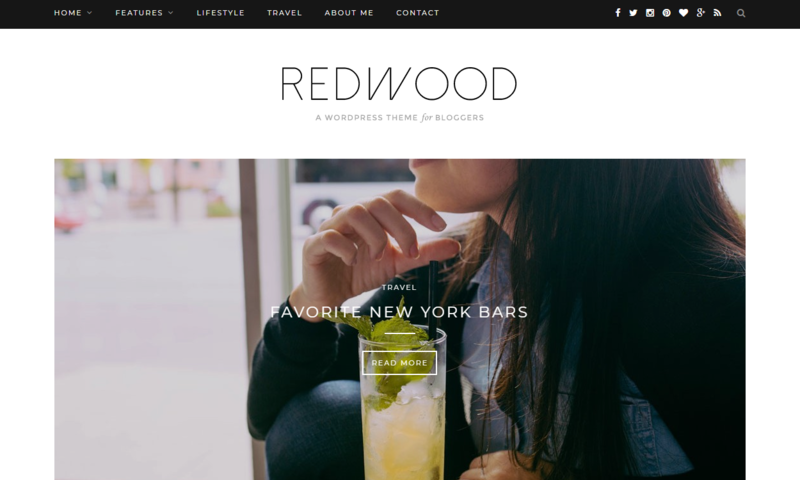 Redwood is a brilliant WordPress blog theme best optimized to attract huge visitors to your site. It comes with classic, clean and stately aesthetic design. The theme is just perfect to give a professional look to your blogging site. It features a stunning slider and promo boxes to let your important content shine. This SEO friendly theme offers various custom widgets – you can enhance the functionality of your site as per your requirement. 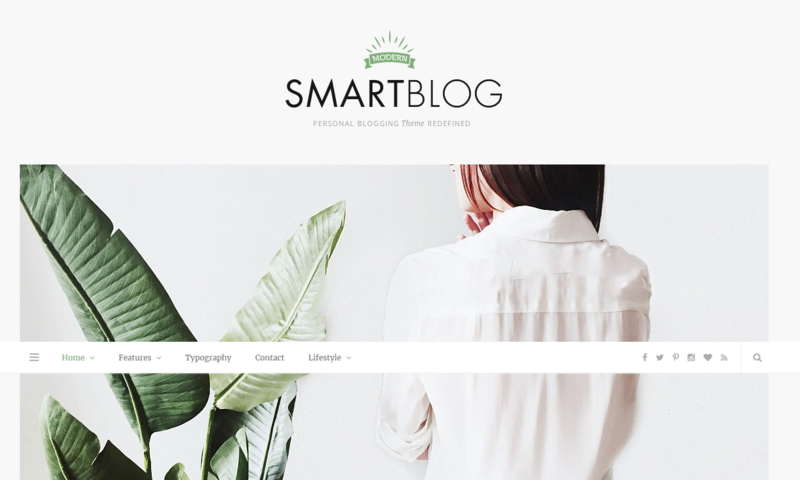 SmartBlog is an elegant premium blog theme for WordPress. It is a complete theme best suited for all kind blogs. It is an easy-to-use theme with awesome WordPress live Customizer based backend system. The theme offers various style options to let you display your contents in a unique and visually appealing way. 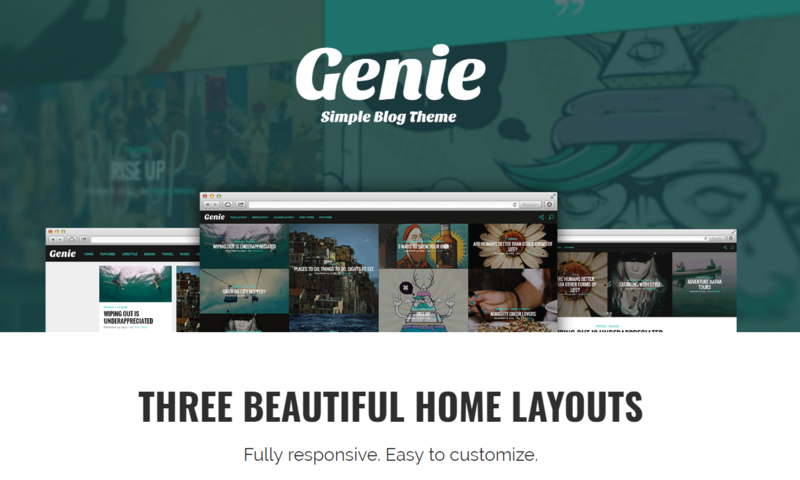 Genie is simple yet powerful WordPress personal blog theme tailored with tons of exciting features. The theme is best optimized for great functionality and usability. It offers 3 different tile/grid layout, 6 different blog post layouts, 2 header layouts and sticky header. For advanced functionalities, the theme includes custom widgets such as Instagram gallery, Twitter wall, photo gallery etc. 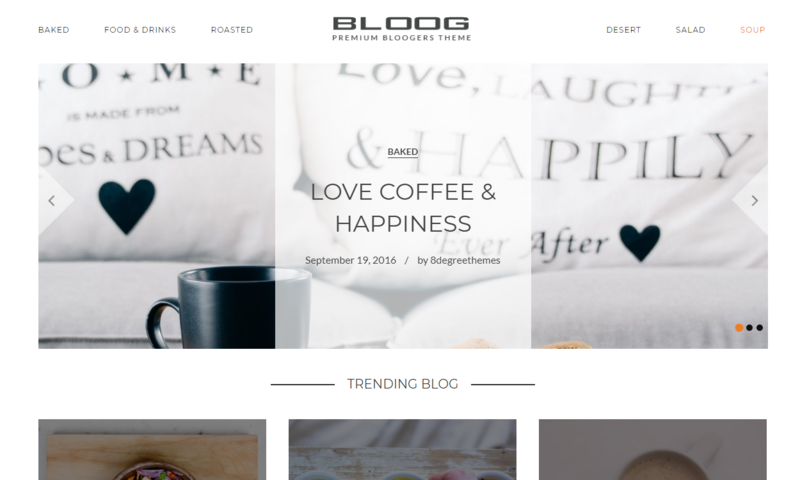 Blogist is yet another feature-rich, beautiful WordPress personal blog theme with a clean and elegant design. The theme is carefully crafted focusing the need and necessities of a professional blogger for a successful online presence. It includes unlimited color options, 56 fonts, custom meta boxes, 7 post formats and many other exciting features. 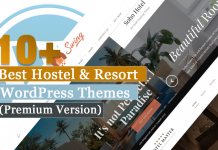 Hey Buddy!, I found this information for you: "30+ Best Premium WordPress Blog Themes 2019". Here is the website link: https://wpallclub.com/best-premium-wordpress-blog-themes/. Thank you.